From now on ALL knives and so on, whether damascus or not will be placed on this page. It's too much of a html-pain to seperate them. I hope this clears up any confusion, if it even had the potential for making confusion. This is an L6 knife with an oak handle. 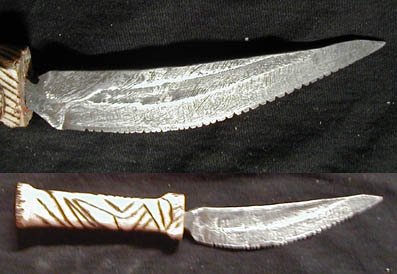 This is a damascus knife (120+ layers) made from 1095 and 1018. The handle is oak and the decorations on the handle were burned in. This is a flame knife made from 5160 steel. It was left with its oil quench coating. The quillion is 1018 steel, and the handle is oak. This is my first composite hatchet. 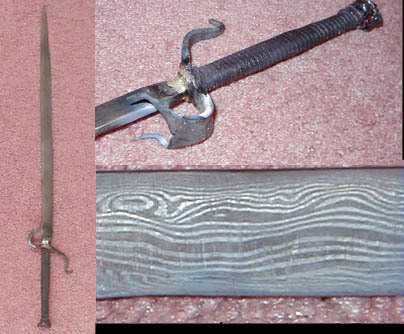 Its made from 1018 and 1085 steel. The handle hole was hot punched and it was given an oil quench. It weighs about 1lb. This is a 5160 knife with a cherry, burned handle. It has a mild steel quillion and brass pommel cap. This is a 100+ layer damascus flame dagger. Its ~12" long. The handle is cherry with a leather wrap. There is a mild steel quillion and bronze pommel. This is my first 'tribal' knife (to clear up confusion, and perhaps make some confusion, 'tribal' means no power tools were used). The blade was forged as sharp as i could make it, then i used a rock i found to sharpen it the rest of the way (a piece of quartz, pictured to the right of the knife). The handle was cut from a broken stick in the woods and widdled. The tang was burned through the wood. I learned a lot making it. My flame daggers are now 50% more flamming, heh, i made a new swage special for them. This one is 5160 with an oak handle. Its going to be given to one of my friends. This knife was traded to a friend for some materials. Bartering is good. It is a 60 layer damascus blade from 5160 and 1018. The handle is stained oak. This is my first attempt at a leather sheath, not bad for a first? hopefully. This is my first attempt at a halberd. Its roughly 4' high, and is riveted to the stick with 2 brass rivets. I made this knife for a friend because shes cool? It is made from 1095 water quenched steel. The handle is copper. One sided damascus steel sword. Made from two twist pattern and 1 straightline pattern billet. Blade is 17" long. Hand guard is 5160 steel, and it was brazed on. Bottom of handle is copper, the wrap is waxed and shurnken leather. This took 4 days to make, about 20 hours of work! 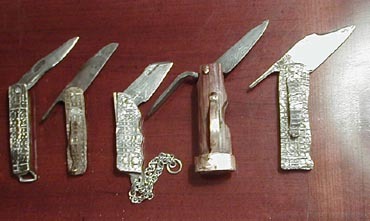 Assorted folding knives. Left to right is the order they were made in. Materials go as follows (from left to right): Spring folder, L6 blade, 304SS handle; friction folder, 5160 blade, bronze handle; spring folder, damascus blade, AL handle; friction folder, damascus blade, hickory and bronze handle; friction folder, ATS34 blade (such a pain!! ), AL handle. 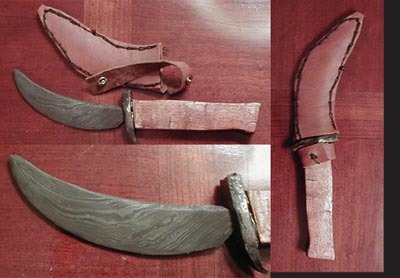 A composite knife, blade is 7.5" long. 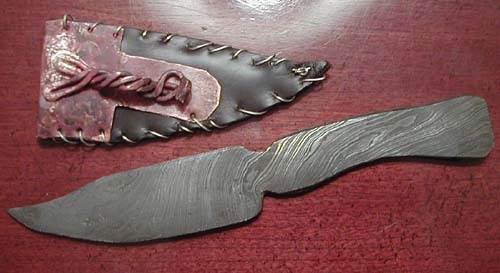 the top shows the knife after the quench--the 'hardened' steel is the diffinitively lighter area. because of that, this knife can be bent at 90 degrees, yet the edge is hard enough to shave mild steel. the edge is also tungsten carbide coated to give it extended life. the handle is freshly cut soft wood (i couldnt find any hardwood in my backyard! ), and when it dries out a bit more i'll pein the tang to fasten it more permanently. 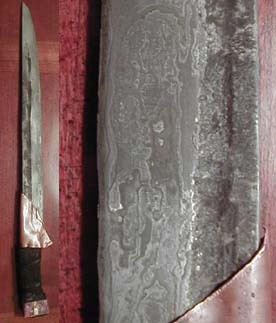 57 layer damascus steel (L6, 1095 and 5160). 8" long total, blade is 4". Scabbard is 4oz waterproof leather with copper and S.S. stitching. About 22" long. Damascus steel edge, mild steel core and back. Leather grip, with copper fittings. So far ive been using it without tempering it after the inutial oil quench, and its been showing very little signs of being too hard.